Prune recipes have undergone an image makeover and are growing in popularity. Prunes or dried plums are ideal for recipes since they are not only sweet and tasty but have a high nutritional value as well. No matter how you use them, they are sure to add an unexpected yet tasty element to your recipes, from appetizer to dessert. Try these simple prune recipes that are not only healthy, but delicious. 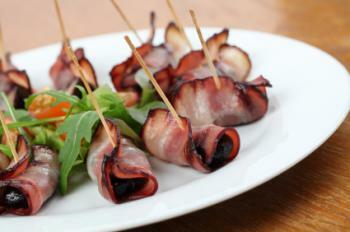 Roll bacons slices around the prunes. Use one slice per prune. Place wrapped prunes on a nonstick baking sheet. Broil until the bacon is browned. Remove from oven and secure each wrapped prune with a toothpick and place on serving tray. 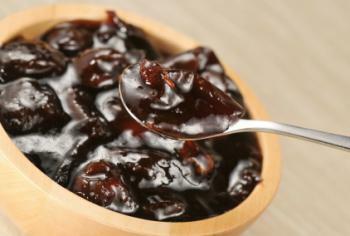 In a heavy saucepan, combine prunes, sugar, lemon juice and water. Reduce the heat and allow to simmer for at least 20 minutes. Stirring frequently until mixture becomes thick. Continue cooking, and stirring often, until the mixture reaches the desired consistency. Pour the jam into a jar or freezer-safe container. Chop prunes and set aside. In a large bowl, combine all ingredients except prunes. Beat ingredients at a low speed until blended. Stir in the prunes until well combined. Drop mixture by the tablespoon, about 2 inches apart, onto an ungreased cookie sheet. Bake cookies for 15 minutes or until golden brown. Prepare the pastry and roll out into two 12" rounds. Fit one round into a 9" pie plate. Combine the prunes with 2 cups water in a large saucepan. Bring to a boil over high heat, then reduce the heat to low and simmer the prunes about 5 to 10 minutes or until they are soft. Drain the prunes and add butter, flour, lemon juice, sugar, cinnamon, and salt and mix well. Let stand for 30 minutes to cool. Spoon the prune filling into the pie crust in the pie plate. Top with the second pie crust. Turn the edges under and crimp to seal. Cut small slits in the top crust to vent steam. 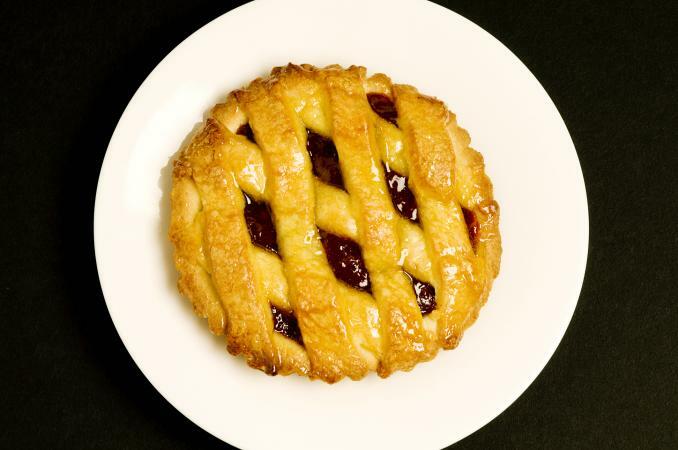 Bake the pie until the crust is golden brown, about 25 to 35 minutes. Cool the pie completely and cut into wedges to serve. Sorbitol, a plant alcohol, is the secret behind prune's laxative quality. These fruit gems are chock full of antioxidants, plus minerals such as boron, iron, copper, potassium, and magnesium. They contain no fat, sodium, or cholesterol. Five dried plums provide five grams of fiber. If you're counting calories, substitute puréed plums for the oil in your baking recipes. The full amount can be substituted, but not always recommended, because puréed fruit has a higher moisture content. The simplest solution for using puréed prunes when baking is to grab a couple of jars from the baby food aisle. Although it is possible to dry plums at home for snacking and cooking in recipes, commercially-dried ones are often the better option. 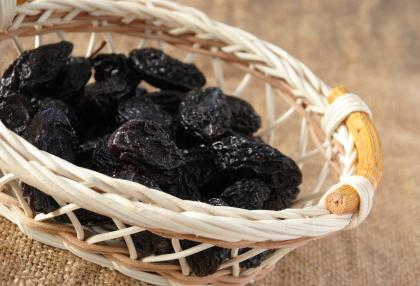 Commercially-dried prunes are also treated to inhibit mold growth and spoilage. 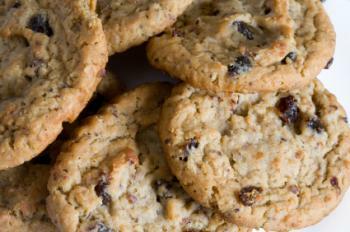 Many dried plum recipes require that the fruit be plumped beforehand. Plumping also reduces the cooking time. Before plumping, chop prunes with kitchen shears or a knife. If using a food processor, freeze the fruit first so they won't be sticky. Prunes can be rehydrated in one of two ways. Once soaked, they tend to look like the fresh, raw product. Soak in water 5 to 10 minutes and then simmer until tender. When purchasing prunes, take care to select ones that are naturally plump, soft, and shiny. When packed in an airtight container and kept in a cool, dark, and dry place, they will keep for several months. If refrigerated, prunes will last up to six months. Be adventurous and take a walk on the dark, sweet and dried fruit side of life.